C.P. Generator Inc. has been a Production and Custom Remanufacturer for over 57 Years. Specializing in Alternators, Generators and Starters . For any Car, Truck or Industrial applications. We carry thousands of units for Gasoline and Heavy Duty applications. Don't have yours in stock, NO PROBLEM! *Want yours built anyway? additional charges apply. Every ALTERNATOR is remanufactured to meet or exceed original manufacturing specifications and is tested thoroughly for performance and quality. 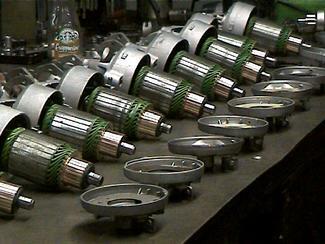 Every STARTER is remanufactured to meet or exceed original manufacturer specifications. Vigourous machine load tests are performed to assure a quality long lasting product. * Highest quality switch solenoids w/cadmium plated contacts. * Self lubricating bushings. each individualy sized to tight tolerances. * Drives are remanufactured w/ high temp. grease, new rollers, springs and drive caps. * Armatures are remanufactured w/ new commutators and machined for roundness.